The panel tasted the Tempranillo category on November 17th and featured 29 wines from 19 producers and 9 single vineyards with the category split between 45% being Texas High Plains wines, 45% being Texas and the remaining 10% consisting of Texas Hill Country and Texoma AVAs. The panel demonstrated an acute degree of consensus with average Panel Consensus score of 0.63, which means that on average the judges on the panel tastes within 2.52 points of each other on a 100 point scale. Syrah is one of those categories that continues to show well, and not just for current vintages. Here is our Top 10 and Top 3 with reviews and ratings of the best Syrah/Shiraz we tasted in 2016. Here is our Top 10 list of the best Viognier starting with the Top 3 we tasted in 2016. Below are also the panel reviews for the top 3. 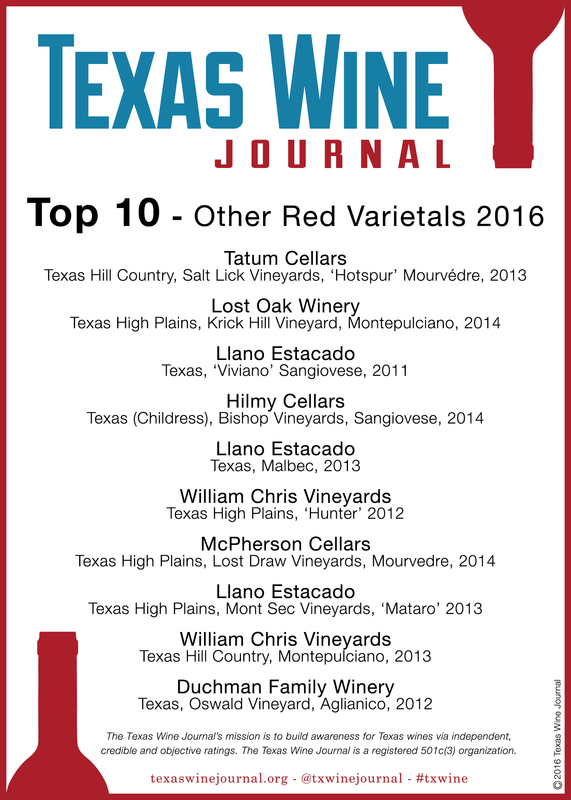 Here is the Texas Wine Journal’s top ten selections from the 2016 producer submissions of Viognier. 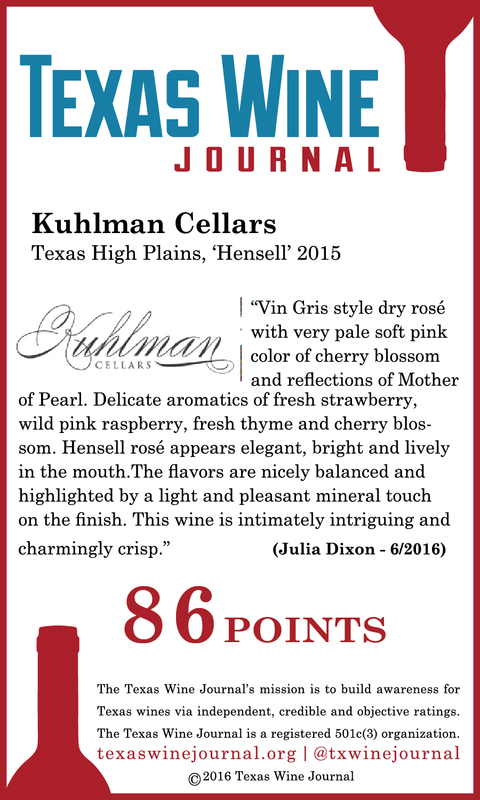 The Texas Wine Journal announces the Top 10 and Top 3 White Blends out of the producer submissions from all over Texas. While there are some familiar names on the list there are also many new producers making the top 10 list this year. The judges panel will be tasting this category for 2017 in April. 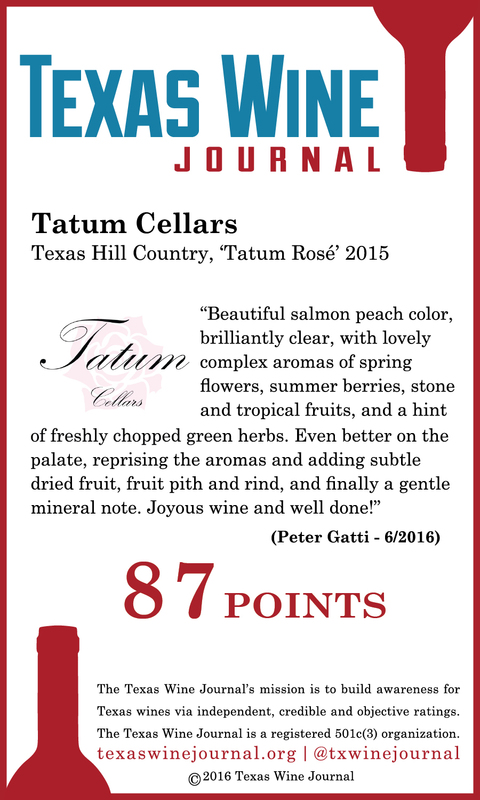 The Dry Rosé category featured 20 Texas wines from 17 producers, that came from grapes sourced from across the state; ten (43%) were appellated Texas, three (13%) were appellated Texas Hill Country, and seven (30%) were appellated Texas High Plains. 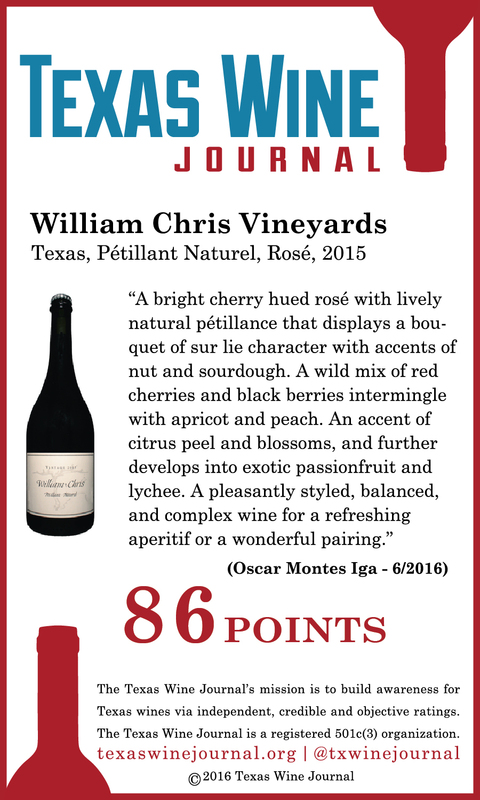 The 2015 vintage comprised of the largest percentage of total wines submitted at 83%, followed by 2014 at 17%. The Other Red Varietals category featured 45 Texas wines from 23 producers and 10 single vineyards, that came from grapes sourced from across the state; twenty-four (53%) were appellated Texas, ten (22%) were appellated Texas Hill Country, and eleven (24%) were appellated Texas High Plains. The 2013 vintage comprised of the largest percentage of total wines submitted at 38%, followed by 2014 at 29% and 2012 at 24%. The overall category was divided into two separate tastings, Other French Red varietals (including Norton and Black Spanish/Lenior) and Other Italian Red varietals, the data from each of these tastings were combined and analysed as a single category. The Cabernet Sauvignon category featured 26 Texas wines from 17 producers and 7 single vineyards, that came from grapes sourced from across the state; eleven (42%) were appellated Texas, two (8%) were appellated Texas Hill Country, eleven (42%) were appellated Texas High Plains and two (8%) was from the Texas Davis Mountains AVA. The average price of the wines submitted is $31.43, which ranged from $12 to $90 and included the following: 1 from 2002, 1 from 2007, 1 from 2008, 2 from 2009, 5 from 2010, 3 from 2011, 8 from 2012, 3 from 2013, 1 from 2014 and 1 non-vintage.